Snow Common Operational Picture (SnowCOP) is a configuration of Operations Dashboard for ArcGIS that can be used by operations managers to monitor snow event responses and determine which streets are not getting attention. The application leverages ArcGIS GeoEvent Extension for ArcGIS Server to visualize real-time locations of vehicles and assets. This feed can be used to visualize the location of vehicles and other assets used in your snow response plan. If you use a different automated vehicle location (AVL) application for your vehicles or assets, you can configure the SnowCOP map to leverage feeds from your AVL vendor. Finally, SnowCOP provides public works or transportation directors a jurisdiction-wide view of snow response activities to ensure performance standards are met; and district managers a focused view of their maintenance district so they can effectively assign resources during a response. To deploy SnowCOP with the ArcGIS Solutions Deployment Tool requires specific software. Application SnowCOP An application used by public works operations managers to monitor snow event response activities. Map SnowCOP A map used in the SnowCOP application to monitor snow event response activities. Feature layers CitizenProblems A feature layer used to store non-emergency problems reported by general public. 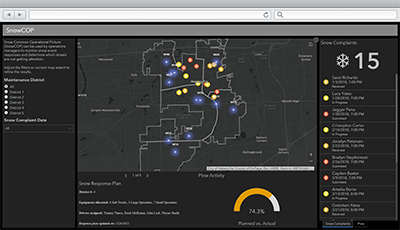 SnowResponsePlans A feature layer used to plan and track resource assignments and plow activity during snow storm responses. SnowIceProblems_dashboard A feature layer view used to monitor reports of snow or ice problems reported by general public. Below are the release dates and notes for SnowCOP. Replaced SnowIceProblemReports with CitizenProblems feature layer and SnowIceProblemReports_dashboard with SnowIceProblems_dashboard public feature layer view. First release of SnowCOP with the Operations Dashboard for ArcGIS and GeoEvent Extension for Server.